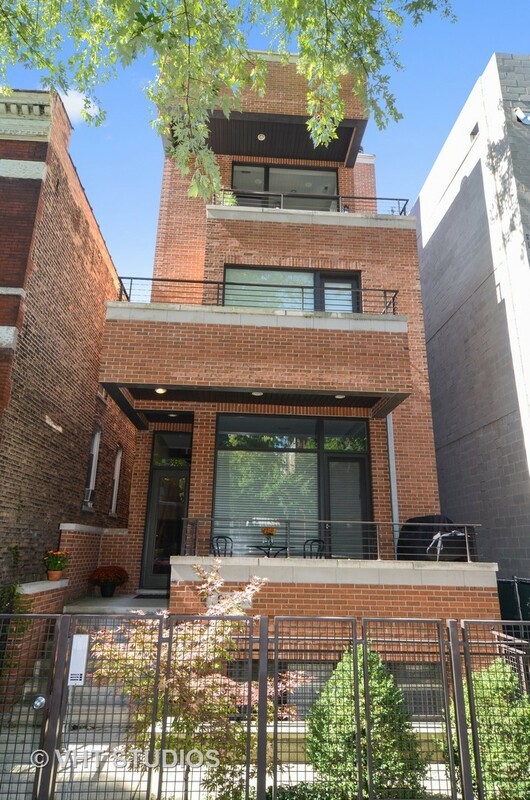 Exceptional 3BR, 2.5BA duplex-up Penthouse with skyline views & a private rooftop deck! Sophisticated city home has modern lines and warm finishes. Light-filled & high ceilings; photos don&apos;t represent how large the space is. Living room has a gas start/wood burning fireplace and adjacent front terrace. Kitchen designed with timeless shaker style cabinets, quartz counters and island. The master suite includes a walk-in closet and blackout shades; master bath features a whirlpool tub, luxury shower system, steam shower and heated floors. Interior stairs lead to top floor office and through to the roof deck, complete with built-in planters, a hose bib, lighting and speakers. In-ceiling speakers throughout the home, security system and in-unit W/D. One garage spot included. Prime East Ukrainian Village location on tree-lined Winchester Avenue; steps from shops, restaurants, & nightlife on Division St. & Chicago Ave! And conveniently walkable to the Blue Line.